It seemed to me, then, that love exists balanced on the edge of a knife, with self-doubt on one side and temptation on the other. And if you succumb to both, there's nothing for you but to be sliced in half, right down the middle of your wanting heart. I was so, so close to the blade of that knife. To save the girl he loves, Will Mallory destroyed his only means of returning to his own world, a decision that lays heavily on Will and Cara as they try to navigate the new life--the human life--they're building together. In the sequel to the acclaimed Caterpillar, a horrifying mistake sends a frantic Cara on a mission to the other side of the country to find James Napolitano, Will's genetic twin. Meanwhile, Will is stalked by a woman from his past, who promises to teach him the control of his Eolian abilities that he's sorely lacking, but at a price that may be too high for he and Cara both. Temptation and danger lurk at every turn as Cara and Will are forced to confront their greatest fear: that the love they've nearly died for may not be enough. 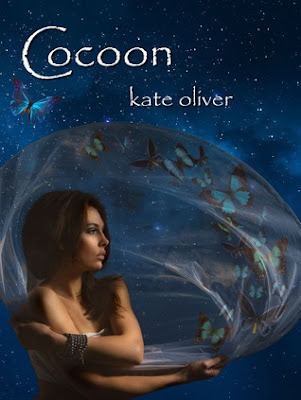 Kate Oliver's fantastic Metamorphosis Trilogy continues in the second installment, Cocoon. Cara and Will continue to tread carefully through their unique relationship, hurdling over new obstacles with emotional grace. As the series moves forward, so does Cara and Will's lives. Cara is nearing the end of her high school days, planning for college and looking forward to embracing independence, while Will struggles to determine what his next move should be. Through all the realistic issues the characters face, Oliver doesn't forget to add in the shocking plot twists and impossible outcomes. Will meets another Eolian, but she's doesn't boast the same peaceful manners of Eolians. Anya, beautiful and charming as a snake, does everything in her power to force Will to travel back with her to their home planet. The resulting conflicts set readers up for an emotionally charged novel with plenty of action to spare! New revelations about Eolians and their genetic history comes to the fore, but not all information positively affects Cara and Will's relationship. Oliver certainly remains a consistently refreshing author. Cocoon flows at an equally relaxing and exciting pace. The plot is colored with passion, honesty, and genuine growth as Cara, her sister Liv, and Will explore their relationships and familial bonds. Readers will adore Cocoon and eagerly await the next, and final, installment in the Metamorphosis Trilogy! Gahhh1 The front cover looks really good!!!! LOVE her hair! haha lol awesome review!! !